I didn’t get an April fools joke done this year. 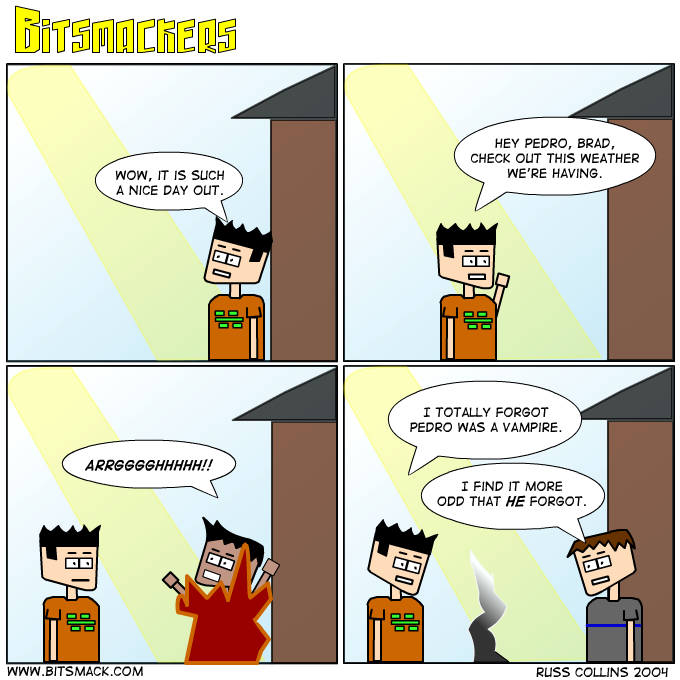 Just <a href=http://www.bitsmack.com/modules.php?op=modload&name=Comics&file=index&action=comic&id=398>this comic</a> instead. There’s not much going on in the world of video games lately. Final Fantasy XI was released for the PS2, though I don’t know why anyone would want to pay $100 to play a game that’s already been out for the PC for awhile. It’ll probably be the same people who can afford $13 a month just to play one game. I’m waiting for the day that Konami turns DDR into a MMORPG. K-dog would plop down $10, $15, even $20 a month to play that. Maybe I’m just cynical because I’ve never found a game that could hold my attention that long. What do you guys think of MMORPGs? Have any of you tried them? Are they worth the monthly charge?